The Truth About Basically Everything: And I thought pioneers were extinct... Who knew? There's something about January that just makes me want to COOK! I don't know what it is, maybe the desperation of realizing the holidays are over and the "well, I'll eat what I want in December and try to do better in January" attitude is not as fun or easy to maintain as I think it will be in between mouthfuls of turtles and fudge on Christmas Eve. So anyway, clicking on the Confessions of a Pioneer Woman link from my friend Christie's blog did NOT help the situation. Oh my good heavens, not only is this this Pioneer person hilarious and she posts all the time, she also has tons of amazing recipes, all with step-by-step instructions and pictures, my friends, pictures!!! 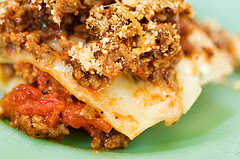 How could I not make "The BEST Lasagna" yesterday after reading this post, and seeing this picture? Yes, it was wonderful and I could barely stand up to do the dishes afterward. Now I am afraid I am going to have to make every single thing on the site. I will probably double in size by my birthday. This is not good! So here is what I would like to propose: A Pioneer Woman Potluck! For all my friends and family and maybe even friends I don't know I have out there, just go to the web site and pick a dish, any dish, and claim it as your own. Then we will all cook our food on an appointed day and get together and we can taste it all! There is no pressure because they are her recipes, not ours, and if they don't turn out, well, it's her fault! How is that? Pretty sneaky? I thought so. Everyone is invited! Well, I guess I ought to draw the line somewhere, since I don't know who reads this: If you have been in prison or are unsure of your gender, well, probably not... (Gender Bender Party TBA). Everyone else, just tell me if you are interested and we will set it up! I LOVE Pioneer Woman's blog. She's amazing. I especially love all the posts about her hubby - they are sweet I almsost cry reading them. And her photos are amazing too. Anyway - I'm totally in on the potluck. That sounds like so much fun! I even know what I'll make! ok, I just looked at the blog and yum!! I am totally in!! Let me know when, It sounds like a lot of fun! Yum. I'm totally going to be making some new recipes this week. Thanks for the new link!! Hi Anne Marie! Love your blog-- You guys have such a fun ward! That is great to link us on your blog! This is so, fun and so addicting! ; ) Blog on! K, her blog is addicting! I would love to make one of her dishes and come par-tay! I am all for trying new recipes. Let's do it! This makes me almost want to cook. I'll cook a meal if it means I can attend a social event. :) You can count me in. Anne Marie, Carrie told me about your fabulous pot luck party. I'd love to come, if that's okay. I don't fit into any of your uninvited categories, so that's good! I loved coming to things in your neighborhood when Gina lived there (I'm Gina's sis-in-law). I just love how you all are so supportive of one another. You have a great neighborhood. I'm adding you to my friends and fam list. Hope that's okay.